Your grandfather once told me it was ok to think about what you want to do until it was time to start doing what you were meant to do – Jim Morris Sr.
My Take on it – I heard about this movie while it was being made and as a baseball fan and a big fan of Dennis Quaid, I even bought the DVD before even seeing it. At the time I watched this movie, I had a dream to be a police officer and this movie actually helped me realize that dream. For two years, I was an auxiliary police officer and this movie’s theme gave me the courage to eventually take a leave of absence from my job and I joined the Israeli Police Force. Having watched this movie many times, it always make me feel very sentimental since this story was so dear to my heart. Watching Jim Morris reach his dream always makes me tear up because I personally can relate to his hard decision and his success in reaching that dream. 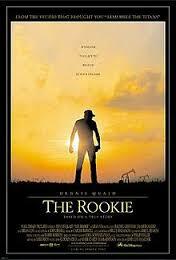 Dennis Quaid is great here as always and this is ne of my favorites of his movies. Look for a young Angus T. Jones (the 1/2 on Two and a Half Men) in his debut role as Quaid’s son. Bottom Line – I love this movie, It’s got baseball galore, along with a message (from Disney) no less, that it’s never too late to follow your dreams.